James Connolly, with his Irish Citizen Army was intent on starting a revolution to depose the British and to establish a socialist government to improve the lives of the working class and the poor. The IRB also wanted a revolt, but with different motivations and goals. The play, which runs for just under one hour, is entitled “Bring Down a Horseman”. It is directed by Conor O’Malley and was written by Eugene McCabe in 1966 for the 50th anniversary of The Risng. 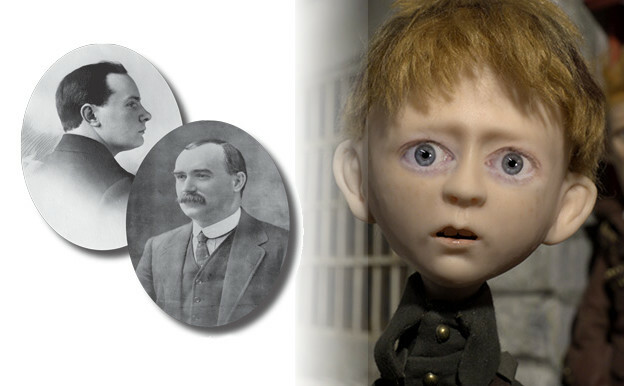 It features Patrick Pearse and James Connolly (played respectively, by Declan Brennan and MJ Sullivan) who debate and argue with one another. Their disparate personalities and seemingly irreconcilable political goals threaten to widen the split between the two groups. Both men know this, and know that each group, acting independently, will be ineffective. How do they bridge this divide? Get along to the Liberty Hall Theatre in Dublin at lunchtime for any of the three performances from 30th March to 1st April 2016 to find out. The play starts at 13:00 (1pm). For more details, and to secure your ticket by buying online visit Pull Down a Horseman. This play has many aspects which are still relevant to Ireland today. So many of the goals and aspirations of these two men remain to be achieved and challenge us as a society. The second event is a series of 9 short films, collectively known as “After ’16” which will be shown back-to-back in the Triskel Christchurch Arts Centre. They commemorate the 1916 Easter Rising, in various different ways and genres. Produced in 2015 under an Irish Film Board initiative, this is a special opportunity to see this work. You can read a review of the films written in February when they were shown at the Dublin Film Festival: Easter Rising shorts to screen at Dublin film festival. Where: Triskel Arts Centre, Tobin Street, Cork. When: Friday, 1st April 2016 starting at 18:15. So, whether you are in Dublin or Cork, or can get there, do enjoy these events which take a look from various angles and dealing with different aspects of the 1916 Easter Rising.